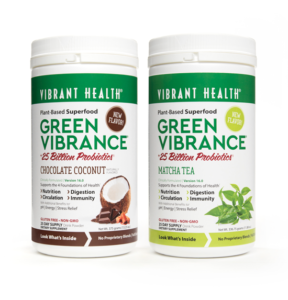 Vibrant Health, a leading manufacturer of dietary supplements, is proud to announce that Green Vibrance Chocolate Coconut and Matcha Tea have been awarded the Amazing Wellness Best New Products award in the category of Superfood Supplements, describing the supplement as a “potent potable.” Flavored Green Vibrance made its debut last fall in celebration of the supplement’s, and the company’s, 25 year anniversary. The formulation of Green Vibrance in 1992 created the green superfoods category as we know it today. This award adds to the supplements extensive award list, earning 13 awards since its launch. As policy, we update each of our unique formulas to adapt to the changing landscape of nutritional science—but this is the first time a flavored variety of Green Vibrance has entered the market. Green Vibrance‘s comprehensive formula delivers 4.5 servings of fruits and vegetables per scoop and supports the four foundations of whole-body wellness: nutrition, circulation, digestion, and immunity. It’s loaded with ingredients that support these foundations, including 25 billion probiotics, digestive enzymes, cereal grasses, goji berries, astragalus, holy basil, and flaxseed powder. With Vibrant Health’s dedication to full disclosure labeling, consumers can take a look at the bottle to find out what other top-quality ingredients are inside. Green Vibrance Chocolate Coconut is a decadent alternative to the classic green superfood taste, with only one gram of sugar per serving. Attendees at Expo West 2017 voted in favor of this flavor of the varieties offered. Sourced from Japan, DōMatcha green tea in Green Vibrance Matcha Tea boosts the antioxidant profile and adds a touch of caffeine, enhancing the energizing effects of the supplement. Combine Green Vibrance Matcha Tea with water or a milk substitute for a refreshing drink.